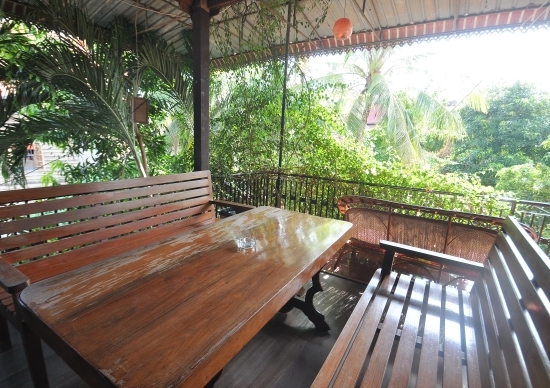 Tucked away in a quiet sidestreet off popular Wat Bo Road, European Guesthouse offers more than just $5-a-night beds in air-con dorms. 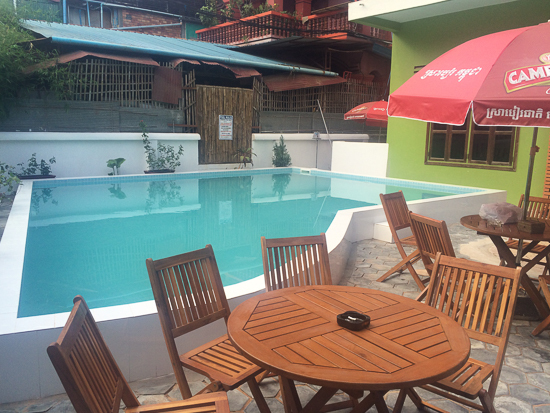 A pool, spacious chill-out area, relaxing hammocks and sun loungers in a shady garden and an al-fresco grass-roofed bar all combine to create a guesthouse that feels a little like a resort and all help to make it much more than just another budget option for travellers to Siem Reap. The European’s reputation on the backpacker circuit has gone from strength to strength over the years, and the recent renovations which saw a great big tidy up and the addition of the pool will do nothing to lessen that trend. Even with the addition of the pool, their prices haven’t gone up. 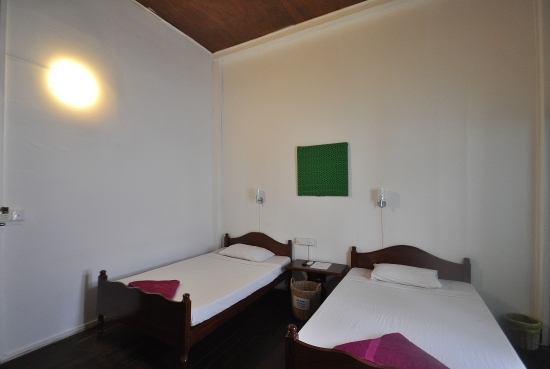 The European’s 14 ensuite twin/double rooms, along with two ensuite dorms sleeping five and six – all with fans and air-con — are in a large and airy traditional two-storey Khmer house. Rooms are a good size, if a little basic, but are cleaned daily, have 90-channel cable TV, WiFi, and wet-room style shower rooms with Western toilets. In addition to the well-furnished shady gardens and pool area, there is also a large bougainvillea-covered balcony on the first floor – a great spot for a quiet sundowner. Sunset here in T minus four beers. 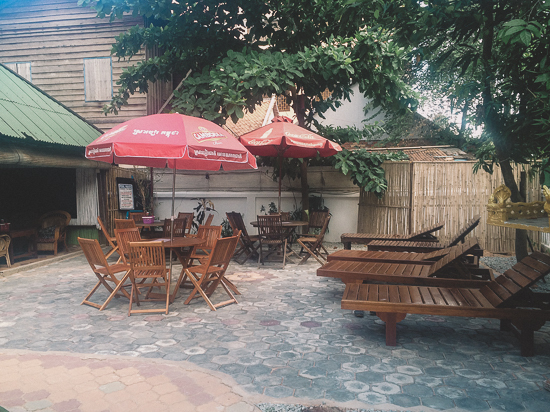 The restaurant sells a selection of Khmer and Western food, which can be enjoyed in the bar and garden area. This is a chatty, convivial place, and also a great spot for some of the live music and other events, like Sunday barbecues, that are held here from time to time. If you don’t want to eat at the guesthouse, or fancy some local fare, the location near Wat Bo Road is close to a good selection of restaurants and bars. Pub Street and the Old Market area with their huge range of restaurants are just a 10 to 15-minute walk away. If you don’t fancy walking there is a trusted fleet of about 15 tuk tuk drivers who will take you into town for around $2. They will also take you on a full day tour of the temples of Angkor for $15 for two people. Clean, fresh and great value. As well as making sure that guests have the best stay possible, the European Guesthouse is committed to social responsibility and actively supports a local NGO – Build Your Future Today. There are regular fund-raising events so you can do your bit to give back to the local community without compromising on the quality of your kick-back and hang-loose time. A near resort-like feel here. They are pretty relaxed about check-in and check-out times (subject to availability), and when it comes time to leave, there is a handy luggage store and communal shower room you can use if you have a long wait between check-out time and the departure of your night bus — go on, have a final night out and still be fresh and fragrant, all the way to your next destination. Check rates at European Guesthouse on Booking.com.